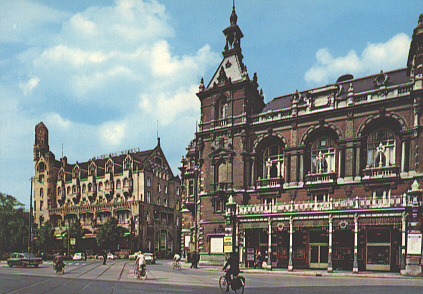 Municipal theatre, built 1892-1892 by J. B. Springer, A. E. van Gendt and Jan L. Springer, on the site of a previous "Stadsschouwburg" theatre (built 1774, destroyed by fire in 1890). 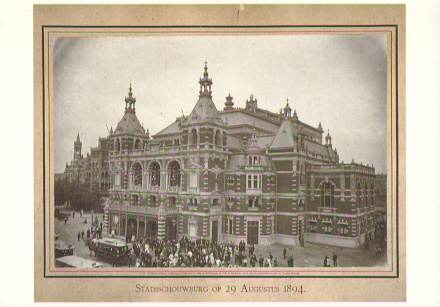 Opened 1 Sep 1894 with Beethoven's Ouverture "Die Weihe des Hauses", H. J. Schjimmel's "In de Directiekamer", and the castle scene from "Gijsbreght van Aemstel". 2005-2008 major rebuilding and renovations. 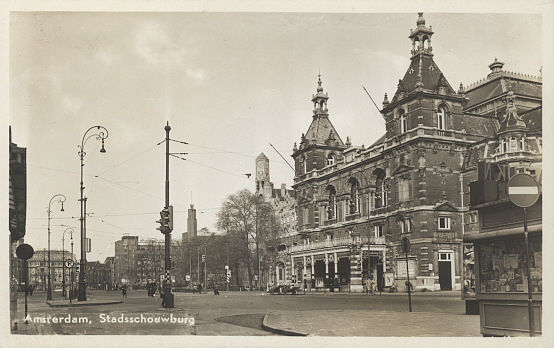 Front Text: "Amsterdam, Stadsschouwburg op 29 Augustus 1894"
Reverse Text: "The Amsterdam Municpal Theatre / Architect Jan Springer / Photo by G. H. Heinen, 1894 / Coll. 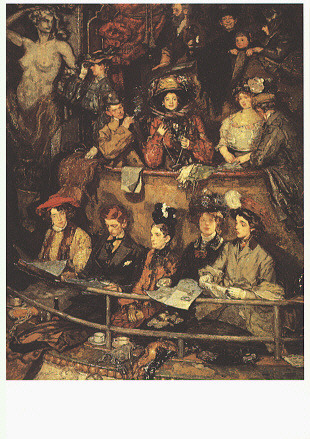 Theater Instittut Nederland"
Reverse Text: "Martin Monnickendam (1874-1943) / Spectators in a box in the Amsterdam Municipal Theatre, 1912 / Coll. 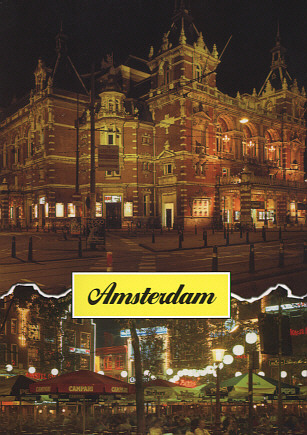 Theater Instittut Nederland"
Reverse Text: "Amsterdam, American-Hotel en Stadsschouwburg / American-Hotel and Municipal Theatre / American-Hotel et Theatre Municipal / American-Hotel und Stadttheater"
Reverse Text: "Amsterdam, Stadsschouwburg (1894) / Leidseplein"